A free for all is emerging among the four major mayoral campaigns as Labor Day approaches and campaign season enters full bore. Among the indicators, a recent low key poll thought to be taken by a special interest group of developers hit an unknown amount of Hoboken homes' landlines. The margin of error and many residents only available via their mobile phones means no one is on top or out of the City Hall sweepstakes. The Hoboken mayoral race is up for grabs as Freeholder Anthony "Stick" Romano, Councilman Ravi Bhalla, City Council President Jen Giattino and Councilman Mike DeFusco are all in the mix bunched up together. with all four major mayoral campaigns in position to claim the top prize. Bhalla and count'em, two for Jen Giattino. 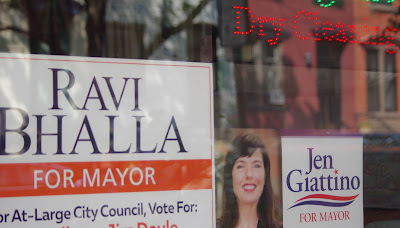 Romano's campaign HQ never closed from the spring freeholder campaign merely replacing the signs for office of mayor. The Bhalla campaign was aided by a head start with Mayor Zimmer's sudden withdrawal and backing but remains in the pack. The Jen Giattino campaign was last to enter but in short order has caught the leaders entering the clubhouse turn. Mike DeFusco's campaign finds itself in the mix with him campaigning almost non-stop since his February "council" fundraiser. It's a long way to the backstretch but the acrimony is well ahead of Mile Square residents winding down summer. More than four dozen comments on last week's resignation of Mayor Zimmer's Chief of Staff who departed oddly midweek to be named campaign manager for Ravi Bhalla reference the unleashed torrent of attacks over on Sybil's Cave or as some are viewing its declarations of a burgeoning enemies lists, Hoboken Antifa. Even the death of a parent is fair game in their mob-like attacks. The rest of this story is MSV Premium content and was released to members today. Others will see a feature "How Jen Giattino saved the Southwest Park" with her pivotal fifth vote on the City Council back in September 2013.